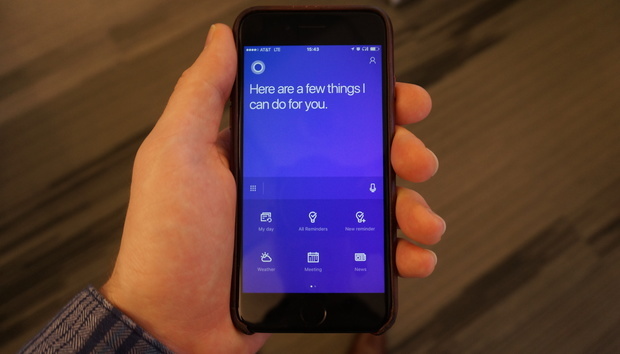 Microsoft gave its Cortana app for iOS a facelift Friday, replacing its old black and blue aesthetic with a new look that puts the assistant’s key features at users’ fingertips. The app now features Quick Actions, so that users can tap a couple buttons and get Cortana to create an alarm, set a reminder, or tell them a joke. That means users can get at key features without having to talk or type queries, and it also gives them a framework for what they can do with the app, without them having to discover it on their own. The virtual assistant market is a crowded one, between Cortana, Siri, Alexa and the Google Assistant all competing for users’ time and interest. Microsoft’s assistant is built deeply into PCs with Windows 10, but the company also needs to keep its apps for other mobile platforms up to date in order to meet users where they are. In addition, the app’s phone call and messaging functionality got a facelift, so users who want to text using Cortana in a move that makes it even more competitive with Apple’s Siri. Cortana’s messaging and calling capabilities got a redesign as well. When users ask Cortana to make a call, the app will fire up the iPhone’s dialer. Sending a message pulls up a view of the built-in messaging app. The redesign is similar to one that the company gave Cortana’s Android app in December of last year.